Radius 360 mm / 14-3/16�. Curve 30�. Width 64 mm / 1-5/16��. For R1 radius C track curved sections. One ramp section corresponds in Iength to the 24130 track section. The bridge program with the look of steel girders takes C Track into the third dimension. Ramps, approaches and overpasses can be built systematically with the sturdy superstructures and 7250 to 7253 pillars. The C Track lies in the bridge and can be slid back and forth, thus enabling you to have a custom installation of the bridges on a layout. 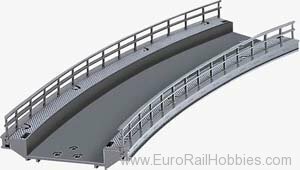 The width of the bridges takes into account parallel approaches even in the track spacing used by the wide radius turnout geometry of 64.3 mm / 2-9/16�. Suitable bases are available for catenary masts and color lights in the bridge area.